CoreBrake™ is a screw-on muzzle brake designed to reduce felt recoil, eliminate muzzle rise and minimize flash and dust signatures. 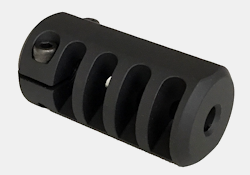 The muzzle brakes are designed to fit Remington 700 SPS (Model 700™ SPS™ Tactical AAC®-SD™), Remington 700 Magpul, Remington 700 XCR Tactical, and Remington 700 TACTICAL CHASSIS Series factory threaded barrels without any modification. They are manufactured with very precise tolerances to be screwed-on and then fastened. 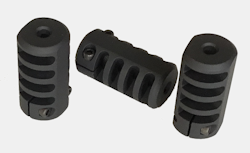 Our four chamber muzzle brakes deliver substantial improvements over the factory and other after market models. In addition to reducing the felt recoil by 55%, the primary advantage of our muzzle brake is the reduction in muzzle rise. Design efficiencies have allowed for a faster target acquisition where muzzle rise is virtually eliminated. The CoreBrake™ is designed to raise less dust or create shock waves off the ground compared to factory and after market models. Field tests have also shown that the overall vertical dispersion is reduced over the factory and after market muzzle brakes using the same load. In addition, the flash at the muzzle is significantly reduced over the factory models.